New Delhi, May 14 (IANS) Refuting allegations of irregularities in political donations levelled against it by sacked Minister Kapil Mishra, the AAP on Sunday said that it followed all prescribed norms and rules and the allegations were part of a conspiracy hatched by the BJP to crush it. 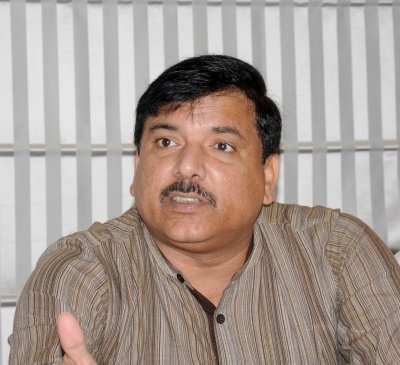 Addressing a press conference here, Aam Adami Party (AAP) leader Sanjay Singh said the the central government and the BJP wanted to crush the AAP and defame Delhi Chief Minister Arvind Kejriwal. “It a conspiracy to de-recognise and de-register the AAP and the BJP is involved in it totally. What Kapil Mishra says, BJP repeats it. What the BJP says, Kapil Mishra repeats. When the BJP leaders speak of corruption, it seems Daku Gabbar Singh is preaching non-violence,” he said. Singh also questioned authenticity of the cheques shown by Mishra while making allegations in his press conference earlier in the day. “Cheques of Rs 35 crore each were shown. Nobody asked where they came from. It is a big fraud. Fake cheques were shown. Anyone can do this. Even I can make such cheque of Rs 70 crore in the name of BJP. I ask BJP leaders to stop shooting its gun from Mishra’s shoulder,” he said. Singh also accused the BJP of changing a law with retrospective effect to save itself from a court-ordered action for irregular political funding. “The BJP and the Congress has not given declaration of about 70-80 per cent of donations worth Rs 1,000 crore in last 10 years. They said these 70-80 per cent donations were received from unknown sources. They are not ready to reveal the source. Whether it came from hawala or foreign companies or organisations?” he asked. Singh said that after the demonetisation, old currency notes amounting to Rs 14.5 lakh crore was in circulation but deposits of Rs 17 lakh crore were made. “Who owns this Rs 2.5 lakh crore? Were they owned by the BJP or the Congress or terrorists? RBI is not giving information about it. Despite of huge corruption, the government is silent,” he said. Singh also raked up past incidences of corruption in which BJP leader were allegedly involved, while noting that the former Chief Election Commissioner S. Y. Quraishi had said that the AAP was the most transparent when it come to to political donations.